Because what else are you going to do on a Tuesday? 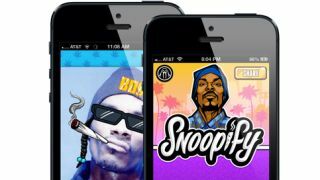 Snoop Lion nee Dogg nee Doggy Dogg has released a new sticker app that lets you share a spliff, cash, shades and comedy hats with the man himself. Already a prolific Instagrammer, Lion's new app encourages you to share your bestickered masterpieces with the masses via Facebook, Twitter and Instagram. Ultimately, the app wants you and all your friends to shell out for more sticker packs (purple grape drank is free but a FO' SHIZZLE tag will cost you, as will stacks of cash, dancing girls, and a PIMP-branded chalice). On a vaguely related note, we still haven't heard back from Snoop regarding his umbrella use. But we maintain hope.